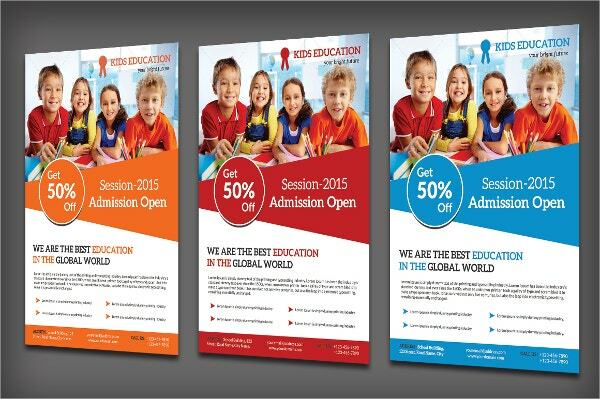 Flyers are one of the most efficient ways of promoting schools or any other educational institutes. They can be used to advertise different facilities of the institute and the programs it offers along with its past records. 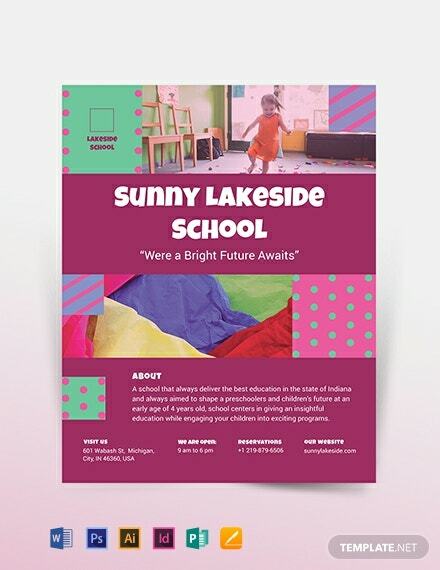 Flyer examples can be printed and distributed in various places of the advertisement or circulated online on various platforms. 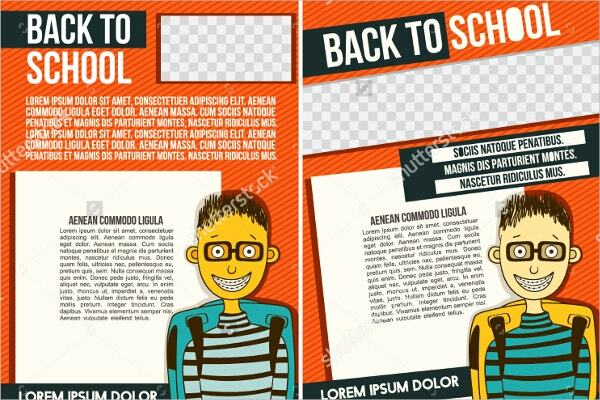 School flyer templates can be really useful in creating flyers especially for people who are not too artistic or don’t know the use of various designing software. 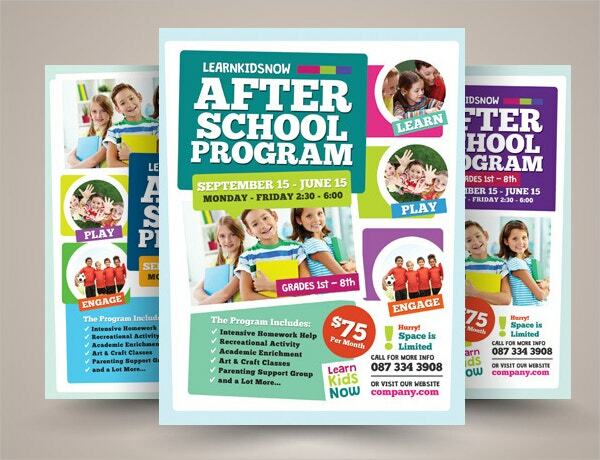 We have a wide range of the most popular school flyer templates listed below. Check them out to find the one best suited for your institute. 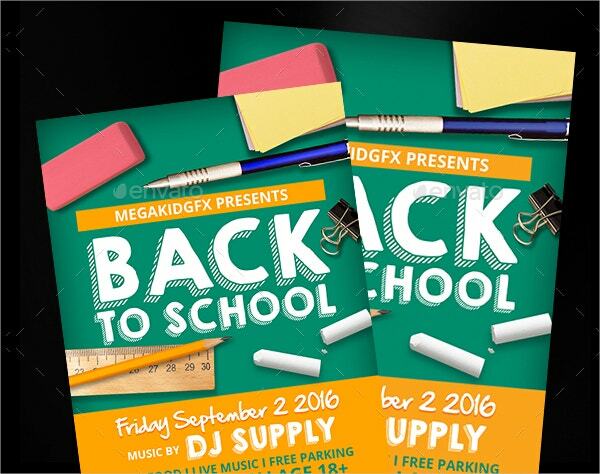 This flyer template has a very vintage look associate with it. It is beneficial for promoting parties or social events having classical 80s or 90s theme. It is available to download in PSD format. It has an area of 6*8.4 inches including bleed area. It has 300 DPI resolution and CMYK colour mode. It can be easily customized using Adobe Photoshop. Instructions for editing are available. League Gothic, Aargau and 4990810 are the available fonts. 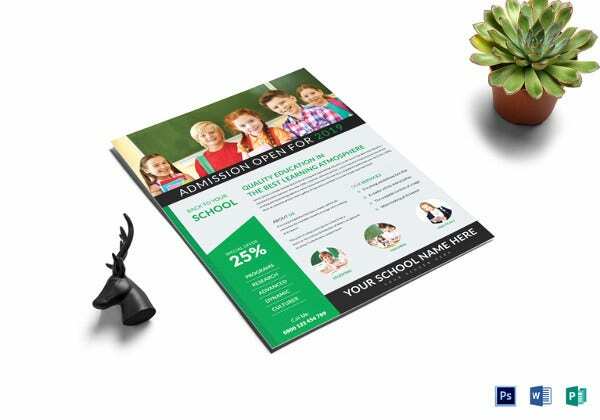 This well designed school flyer template can be used to promote any kind of educational institute. 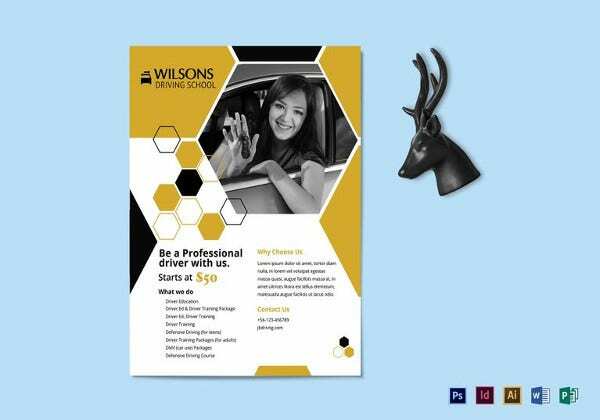 It can be used to advertise the programs your institute offers along with its USPs. 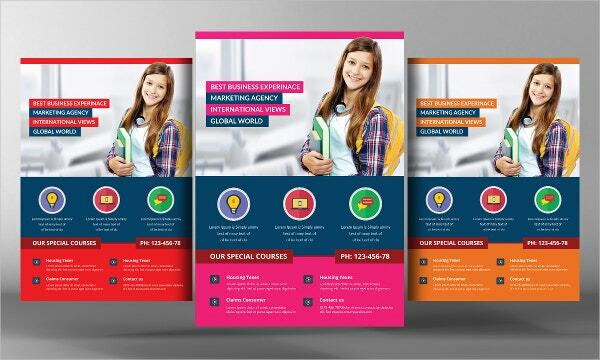 The flyer template is available in 3 different colour combinations. It comes in CMYK colour mode with 300 DPI resolution. It has a size of 210”*297” with 0.25” bleed area. It is completely editable using Smart Objects. Lato, Roboto and Aleo fonts are available for downloading and editing. 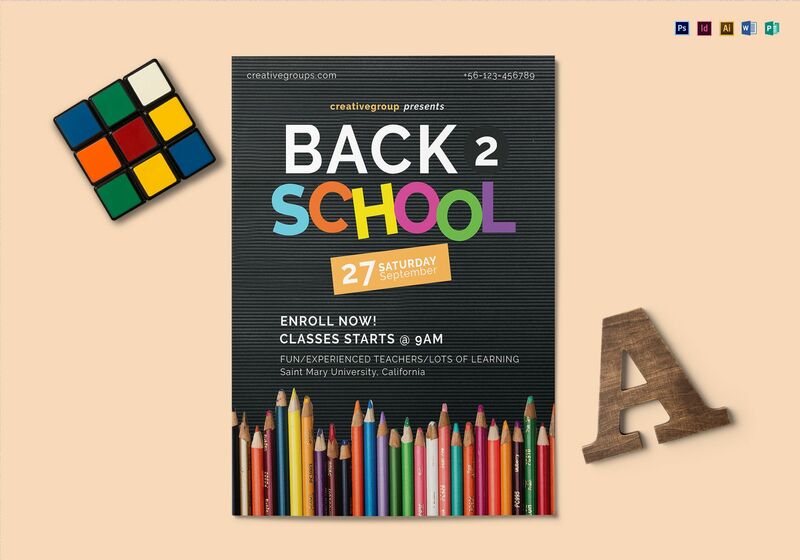 These back to school flyer templates will be very useful to design flyers to be distributed before the commencement of the new session. It is easy to edit with well designated places for inserting required information about the institute. Its blue and orange watercolour splash makes it very attractive. It is available for download in vector as well as JPEG format. 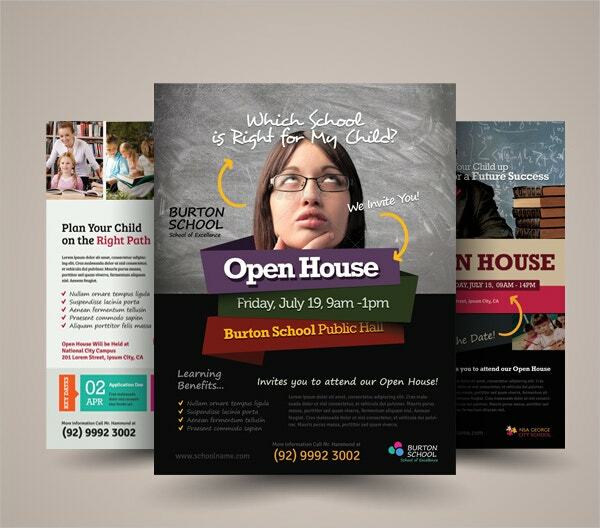 These flyer templates would be very beneficial to create flyers if you wish to conduct an open house i.e. invite potential students and their parents to take a tour of the school. 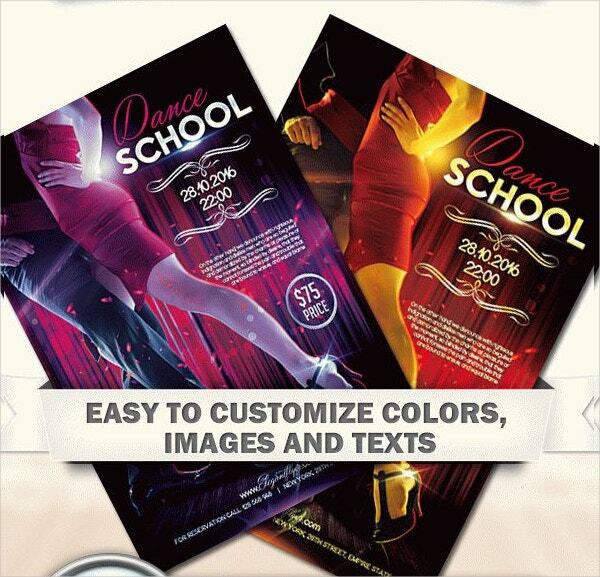 The flyer has 3 different designs, all of which are very beautiful and will surely attract a lot of people. 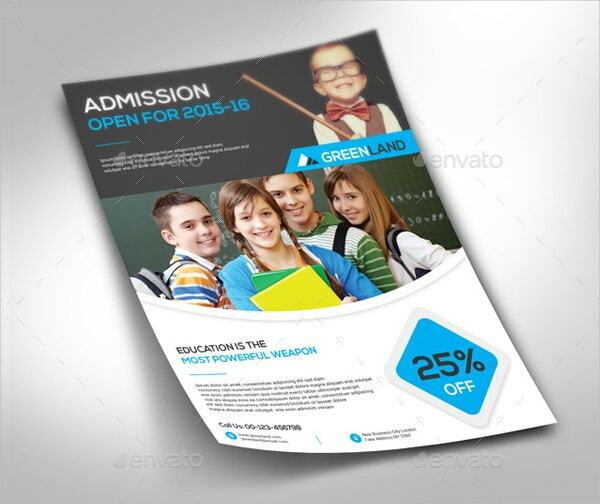 This template can be used by other kinds of educational institutes as well. 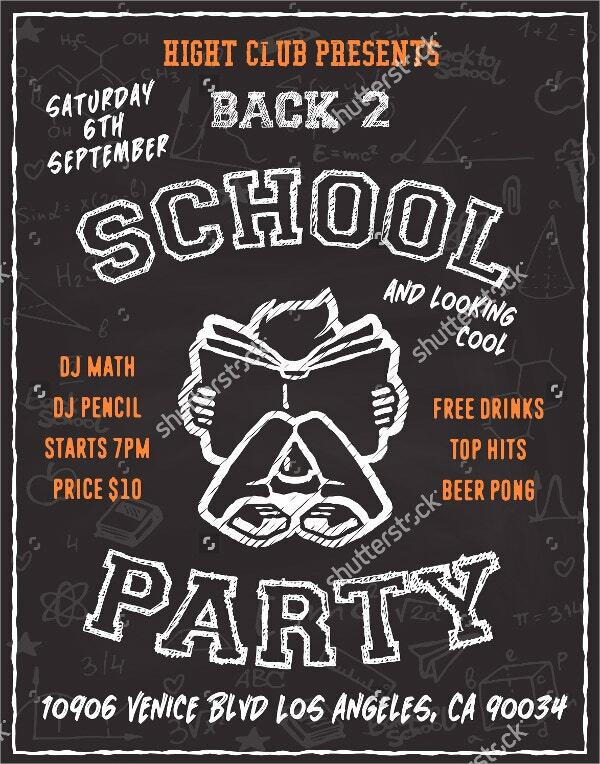 This flyer template can be used to create flyers for parties or social gatherings where the theme is “back to school’. It is easy to edit and specific areas for writing the details of the event are mentioned very clearly. It comes in 4.25*6.25 inch size and is print ready. RBG and CMYK colour modes are available for the editing of the flyers. Links to download the fonts are also available. 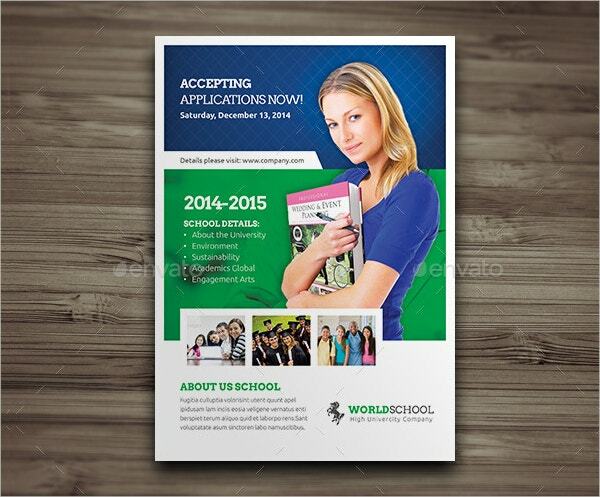 This school flyer template is best suited for advertise institutes which are offering admissions. It is very alluring and comes in 3 different colours. LATO and aleo fonts are available for editing of the flyer. Images are also available to be added to the flyer template if required. It is available for download in PSD format and can be edited using Adobe Photoshop. 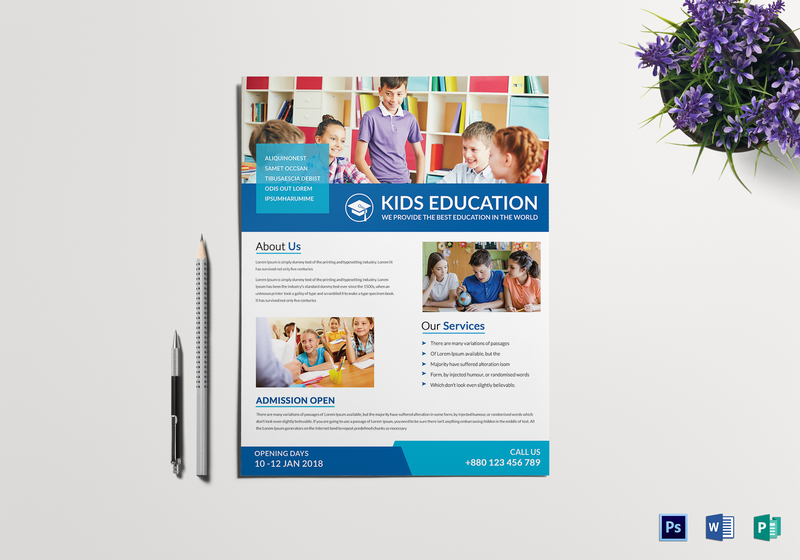 This school flyer template can be used to create flyers for schools and colleges to advertise the availability of seats in different classes as well as commencement of new sessions. It comes in 2 different designs, both of which are very attractive. It can be downloaded in vector format as well as JPEG format. The extended license will allow you to use it in large print and outdoor advertising as well as on merchandise, clothing and artwork. 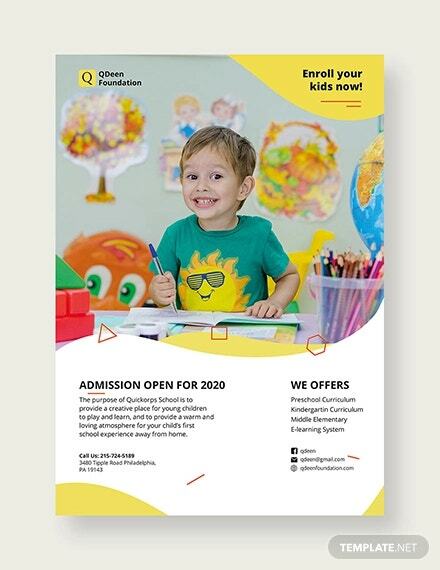 It is a very attractive flyer template useful for designing flyer templates for kindergartens as well as elementary, middle and high schools to show availability of admissions. It comes in various designs and colour combinations. It can be easily edited using Adobe Photoshop. It comes in CMYK colour mode and 300 DPI resolution. Its size is 8.5*11 inches with 0.25 inch bleed area extra available. Nexa and Roboto fonts are available for free download. 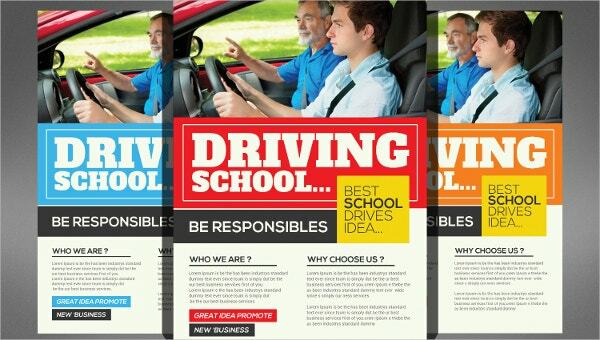 If you wish to promote your driving school by creating flyers then this school flyer template is the perfect choice for you. 3 different colour combinations are available for this template. Smart Objects can be used to edit layers, photos and text. It is available for download in PSD format. It comes in 201”*297” size with 0.25” bleed in each side. Lato, Roboto and Aleo fonts are available for editing via free download links. 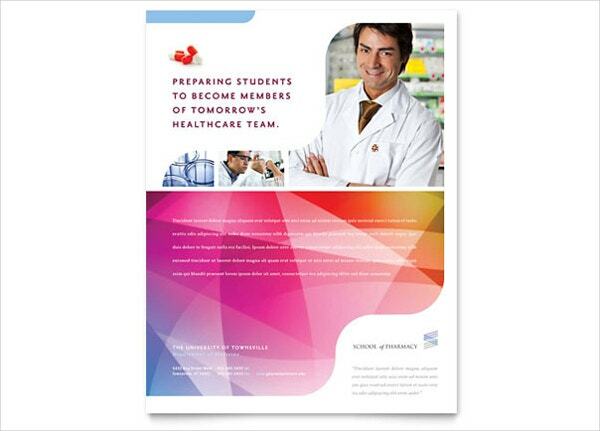 You can also see Student Flyer Templates. 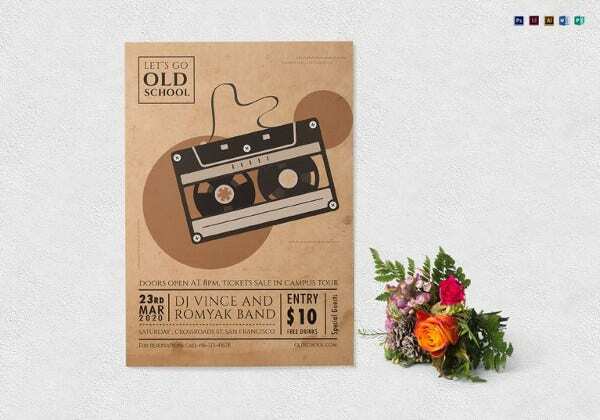 This flyer template with an old school look is perfect to publicize a party before the commencement of school sessions. 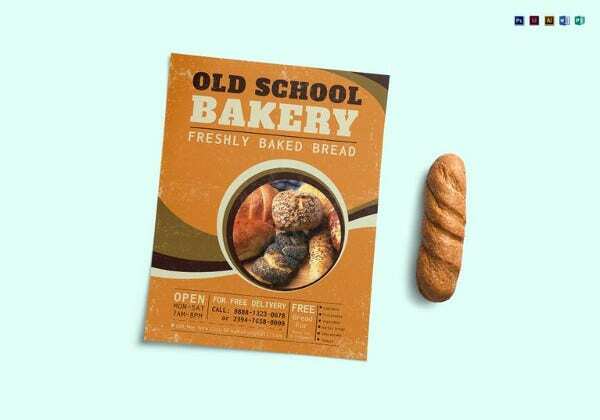 The flyer has a very attractive vintage look which is sure to generate a big crowd. Areas are clearly specified for editing details of the event. You can download it in either vector or JPEG format. It has 300 DPI resolution which doesn’t change on resizing in vector format. 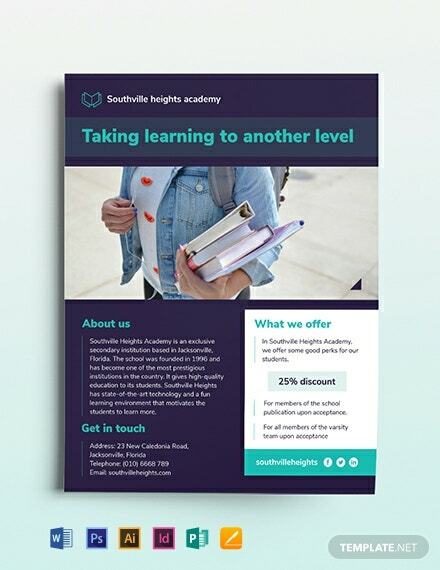 To promote your high school or advertise the availability of admissions by the use of flyers, this flyer template is the perfect choice. It is very well designed and can be brief as well as attractive. It comes in 3 different colour combinations. It is available for download in PSD format and comes in A4 size and is fully layered. Font and colour can be altered as per your needs. Arvo and Ubuntu font links are available for free download. This flyer is print ready. 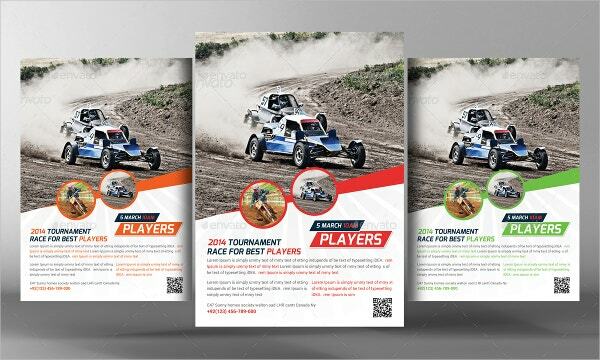 This flyer template is useful for racing events and can come very handy in making flyers to promote them. It has a size of 210”*297” with 0.25” bleed in each side. It comes in 3 different colour combinations. Download links for Lato, Roboto and Bebas-Neue fonts are available. It comes with editable text layers and smart object layers for replacing photos. 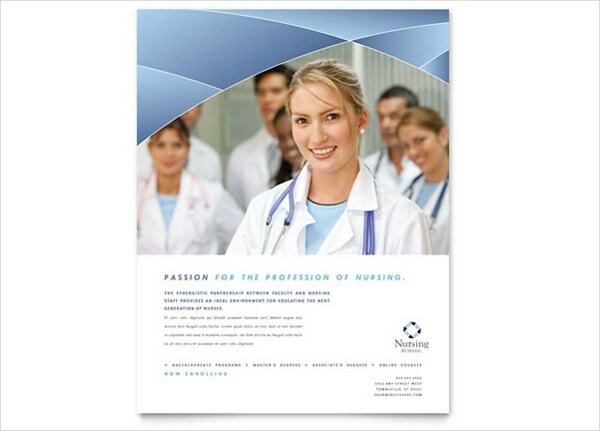 If you want to create flyers to publicize nursing schools then this flyer template will be best suited for you. It is very attractive and will surely generate a lot of publicity. It is easily customizable and comes with high resolution photos, original artwork and logo designs. 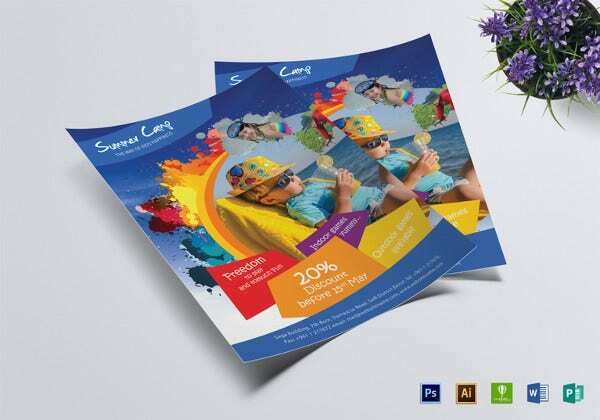 File formats are supported by Adobe InDesign, Illustrator, Microsoft Word, Publisher, Apple Pages, QuarkXPress and CorelDraw. It comes in 8.5*11 inch size. 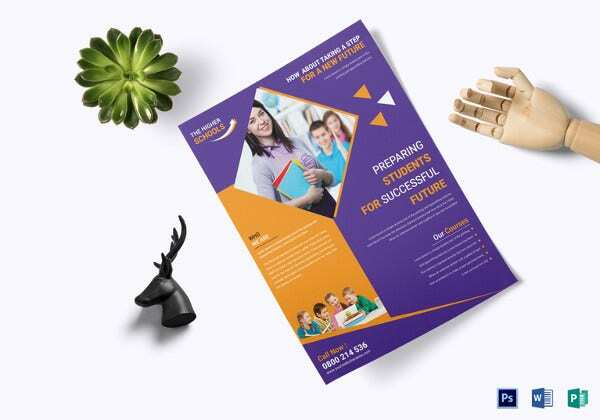 This flyer template can be useful for promoting junior schools and institutions that provide short courses. 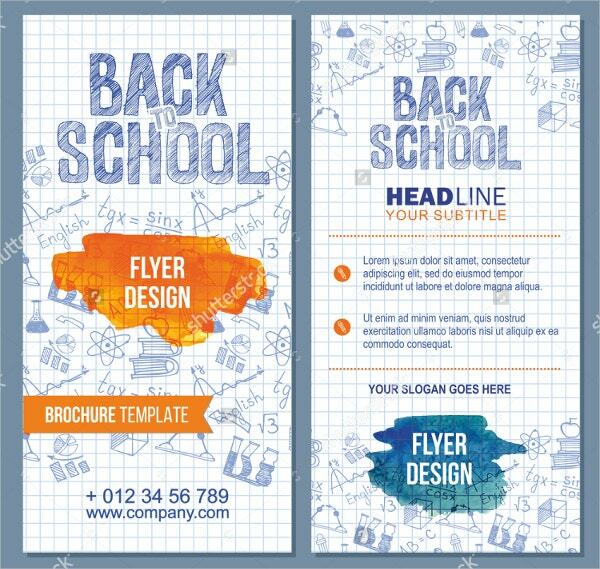 It is a very well designed template and comes in 3 different colour combinations. It has editable text layers. Photos can be replaced using Smart Object. It is available for download in PSD format and can be edited using Adobe Photoshop. Lato and Roboto fonts download links are also available. 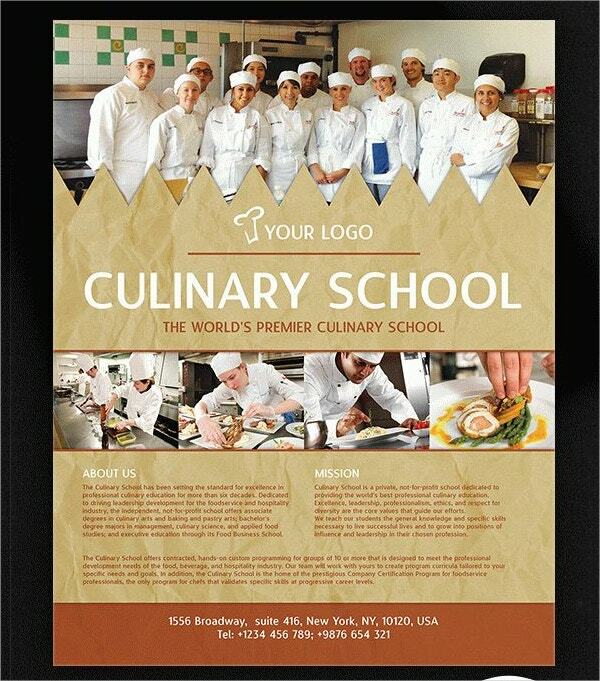 This very well designed attractive flyer template is best suited for your culinary school and can come in handy for advertising the various programs you offer to attract students. It is available in PSD format and you can customize it using Adobe Photoshop. You also get a cover photo for the Facebook page of your institute along with this flyer. It comes in 8.5*11 inches size with 0.25 inch of bleed on every edge. 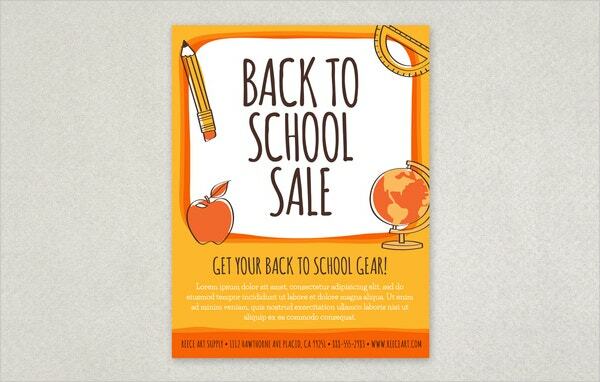 All the above mentioned flyer templates, including back to school flyer templates are among the best available on the internet. 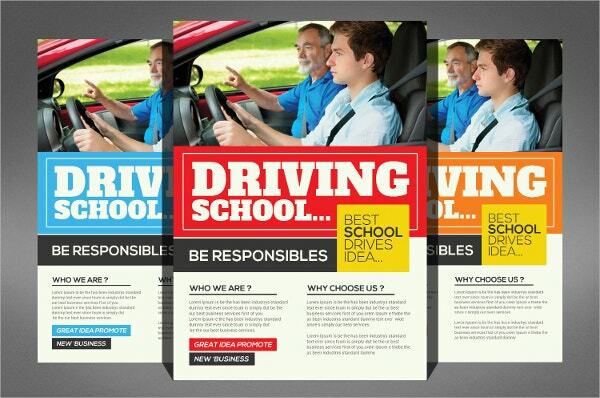 Choose the one which you find the best fit for your institute and use it for promotion of your institute. The flyers are sure to generate a lot of publicity and attract many candidates. You can also see Graduation Flyers.